Safely discover not only OT assets, but IT assets in the OT environment. Identify and prioritize the most critical vulnerabilities that should be remediated immediately and the vulnerabilities that can wait until the next maintenance window. What Is On Your Industrial Control System Network? Security leaders are frequently blind to the IT and OT assets, internal and external connections, and vulnerabilities on their ICS networks. Last quarter’s “as built” documentation and manual inventories are insufficient to deliver the visibility you need to protect your critical infrastructure. Tenable Industrial Security asset inventories and interactive topology maps deliver an up-to-date view of what must be protected. Vulnerability assessment identifies and prioritizes weaknesses that can become the pathway for adversaries to compromise control systems and disrupt critical processes. Comprehensive dashboards and reports simplify stakeholder communication. Data integration with Tenable.sc™ provides a single platform to manage and measure cyber risk across the converged OT and IT systems that support enterprise initiatives undertaken to reduce cost, optimize processes and drive innovation. Identify thousands of OT and IT devices, applications and protocols, including PLCs, RTUs, HMIs, SCADA gateways, desktop computers and network devices. Safely and accurately detect a wide range of OT vulnerabilities through passive monitoring (non-intrusive deep packet inspection) of network traffic. View assets and vulnerabilities by severity, count, name, and more – with OT-tailored information, including system type. Combine Industrial Security passive monitoring with Nessus™ Smart Scanning to maximize insight, while reducing the risk that active scanning will disrupt sensitive OT devices. Deploy Industrial Security as traditional on-prem software that you manage or use it as a service delivered by Siemens. 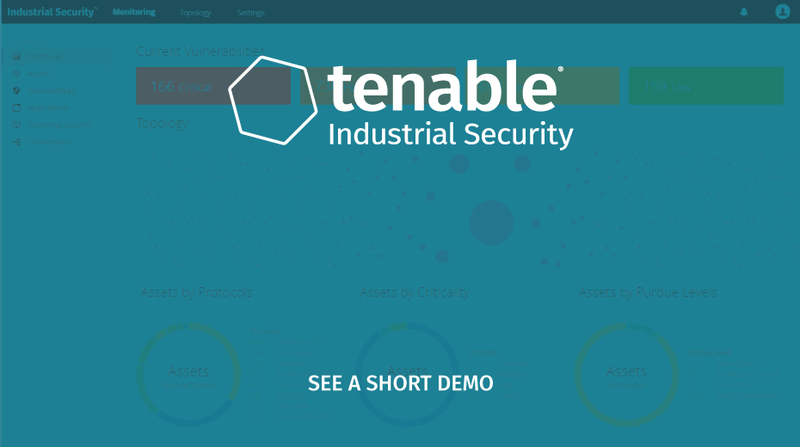 Deploy Industrial Security from Tenable across your distributed operational environment. Gain central visibility across multiple sites/plants through unified administration and a consolidated view of data from multiple Industrial Security instances. Automatically discover and profile the full set of operational systems, applications and services active on your production networks – and the connections between them. Safely and continuously identify and prioritize vulnerabilities in sensitive ICS, SCADA, and other operational technologies that cannot be scanned due to the risk of disruption. Unify your OT and IT security with a single vendor for complete understanding of your modern attack surface. Siemens’ technical experts are available to advise, deploy, and manage Tenable Industrial Security software.